What is lead came and how long should a leaded window last? Lead came is the material that holds the separate pieces of glass together. The lead came is an h-shaped channel so that the pieces of glass slide into either side. The joints are soldered together. Lead is pliable and bends around the glass shapes. Pure or 99% pure lead is used to make long lasting windows. Pure lead oxides and turns white on the outside layer, but the integrity of the metal stays sound for years. Refurbished or contaminated lead had other metals in it such as tin. This makes the lead stiffer, but it will rust when exposed to water causing the came to disintegrate. Good lead should last anywhere between 75 to 150 years or longer. Lead came comes in many different sizes with different thicknesses. Well constructed windows will contain either 3/8" or 1/4" thick lead with the heart of lead at about 3/32" to 1/16". Stained glass windows should be made of lead came. 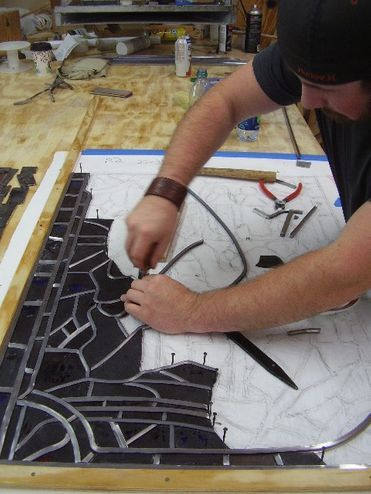 But sometimes, novice stained glass practitioners make the windows using copper foil and solder. Though the copper foil may make the leadline smaller, the window will not properly stand up over time. Copper foil was originally intended to be used to make lamp shades and small crafts, not windows. Lead is pliable which allows it to bend around the glass shapes. Here a worker is leading a window together with 1/4" and 3/8" lead. Note the H-shaped lead channel. All machine made glass for leaded panels is 1/8" thick so that it will fit into this H-shaped lead came. Hand-blown glass varies, but it is roughly 1/8" thick as well. This photo was taken in 2012 of a window that we installed in 1958 at Mocks UMC in Advance, NC. This view is from the outside and the window did not have protective covering on it for 54 years. This photo was taken in 2012 of the same window built in 1958 from the inside. Note the good condition of the lead on the inside and outside. Above is a very beautiful window. However, the window is made of copper foil and is not braced. Unfortunately, it is already sagging which has caused some broken pieces of glass.